I am glad to be home after all my travels. I did get a day or two home between each trip which allowed me time to review lessons, etc. It was nice going back to DC and seeing friends but I don't miss the traffic. I had forgotten how horrible it can be at certain times of the day. TNNA was fun as well. I prowled the booths looking at new products for Penny to review in Cast On and yarns to use in our designs. There were lots of fun things. I would have liked to take some photos but it isn't allowed. The linen skirt and shell from the last issue were in the fashion show. They looked great on the model. The TKGA conference went very well. I think everyone had a good time. Masters Day was successful and we will continue to tweak it. I enjoyed my classes. I was having such a good time I didn't take any photos! The TKGA facebook page will have photos of the meeting. As always, the best part is getting to meet my students and seeing the Master Committee members. I think we had more Master Knitters pinned this year at the banquet than every before. One of the high points for me is that B.J. Licko-Keel, one of the earliest members of TKGA and a fabulous crocheter who was in my Picking Up Stitches class taught me a new cast on. I've never seen this one before. I had been trying out various cast on techniques for my pleated cardigan and this one was perfect. I will do a video for the cast on for the On-Line Extras in TKGA.com when the pattern comes out. Quite a few students signed up for the Basics Course while I was gone. Luckily I can send them links to my DropBox so they can get started right away. Some students have had trouble getting all of the links. There should be four: Cover Letter, General Information, Reference and Swatches. If you don't get all four, let me know right away. Also the files have lots of photographs so some students have had trouble printing them out. If that is the case, I can easily send a hard copy. I saw quite a few students who have completed the course at Masters Day. I'm glad they are going on. The Masters Program is a lot of work but it definitely helps you improve your skills. The students in my Swatch to Sweater class are all making great progress. Lola was in Manchester and brought her sweater. She is well on her way. 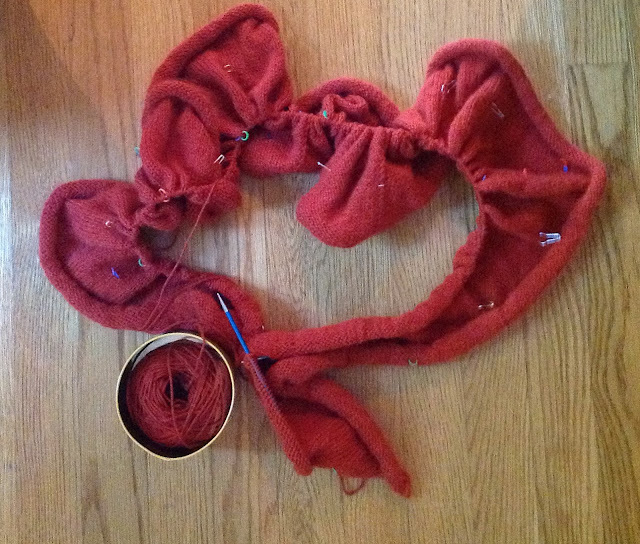 Lois sent me a photo of her progress. She is now shaping the V-check. Kate, who has just started has come up with a great design. She is posting her progress in a blog and is giving updates in Ravelry. One of the most common errors I see in Lesson 2 of the Basics Class and in Level 1 of the Masters Program is twisted decreases. Why is this such a big deal? Twisted decreases have a different gauge and are more noticeable than the untwisted variety and if decreases are twisted on one side of a neckline, they draw the eye and not in a good way. They do not mirror untwisted decreases. Luckily it is pretty difficult to twist most decreases. The only one that is easy to twist is the SKP. Write this rule down: If you are slipping a stitch that will be worked on the SAME row (like a decrease), always slip the stitch KNITWISE. If you are slipping a stitch which will be worked on the NEXT row (like mosaic stitches), always slip the stitch PURLWISE. For most projects you want the decreases to be unobtrusive. If that is the case, use untwisted decreases. If you want the decreases to stand out, use the twisted versions. About the only place you will see twisted decreases in a pattern is in lace. 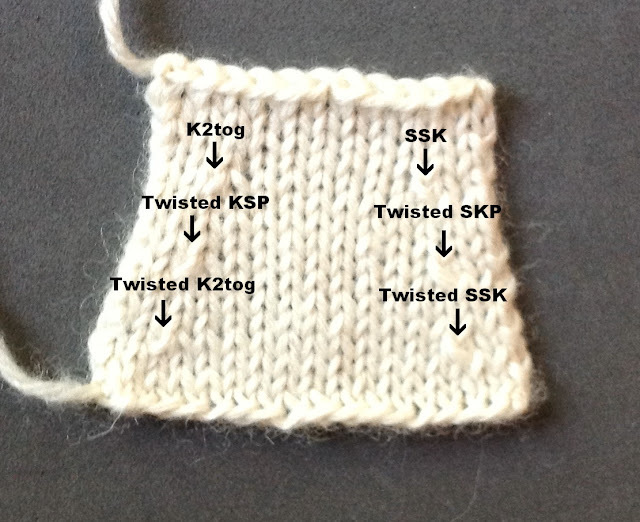 In upcoming weeks I plan to discuss purlside decreases (untwisted and twisted) and twisted stitches in general. Salon will be on Saturday this week. It seems like forever since I've had my friends over. I am looking forward to it. I did not get much knitting done while I was traveling. Of course, I took several projects with me. Even though we drove to DC I didn't knit much in the car. I enjoyed the scenery. It was quite a trip down memory lane. We drove down to Charlottesville to visit UVa and our old haunts (many were still there!) and ran into the protests over the forced resignation of the president. Several of the more business oriented members of the Board wanted her gone she she was dragging her heels at getting rid of unprofitable departments like German and Classics. I was appalled as a student of the classics. All in all, it is a terrible situation. Anyway, I did finish the hats while at TNNA. I made the mistake of asking Jane Miller, one of the editors of Cast On if she thought I had enough I-cords on the hats. She gave the wrong answer so I spent my evenings making I-cords. Again, I want to thank Charles Gandy for the idea. His Dread Socks in this new book The Embellished Sock (a blatant plug!) inspired me. It is so lovely, it is now on my coffee table! 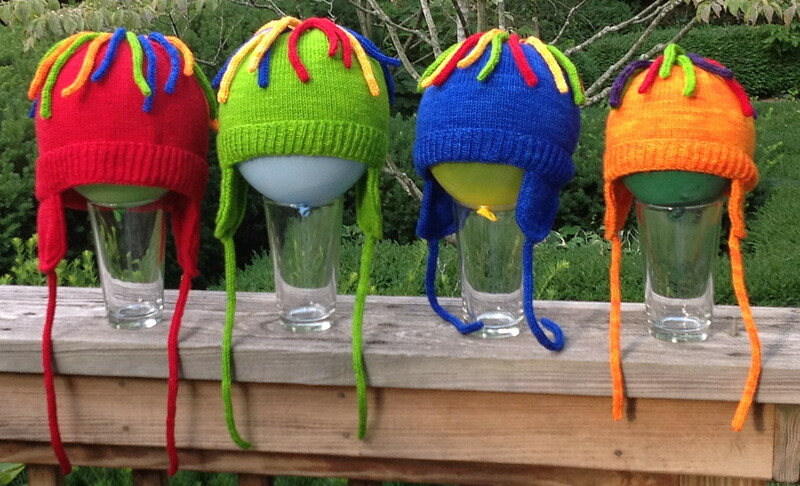 The hats were so much fun to knit. I showed them to Mira Cole, the owner of Baah! yarns and she was thrilled. After the photo shoot I will send her one. I finished the Breakfast at...socks for Cast On as well. Since I photographed the pair I made early I won't post another. Now I am working on the Pleated Cardigan. I am beginning to realize that I am crazy. First of all I do all of those Fair Isle sweaters with lace weight yarn and now this! Pleats require three layers to be folded. The sweater has 10 pleats. Think about it. I had to cast on 656 stitches. The pleats are at the bottom of the sweater and are 6.5" long. I only have one more row until I can work the pleats. This photograph does not really show how long the piece is right now. According to my gauge calculations it is 107 inches long. After the pleats are worked, it will be 40 inches. (The back and fronts are worked at the same time. The photo does show all of the markers. When you do pleats you have to have slipped stitches at the fold lines. Figuring how many stitches to cast on really requires math and geometry. I found it exhausting. I am so glad B.J showed me the cast on. I didn't want a bulky cast on (the pleats are bulky enough). This one is perfect. Also, it isn't a long tail variety so I didn't need to try and figure out how long of a tail I needed for 656 stitches! Later today I will pleat the thing. There will be a braid using three colors to separate the pleats from the body. One of the booths visited at the TKGA conference was Dusty's Vintage Buttons. They only sell at shows, not on-line since so much of the stock is one of a kind. She has amazing buttons. Penny Sitler, the editor of Cast ON, picked out the buttons for this sweater...composition buttons from 1880. I always look forward to visiting the booth as I have a weakness for vintage buttons, especially mother of pearl and bakelite. Here are the latest for my collection.